The Church is one, notwithstand- ing her division as it appears to a man who is still alive on earth. It is only in relation to man that it is possible to recognize a division of the Church into visible and invisible; her unity is, in reality, true and absolute. Those who are alive on earth, those who have finished their earthly course, those who, like the angels, were not created for a life on earth, those in future generations who have not yet begun their earthly course, are all united together in one Church, in one and the same grace of God; for the creation of God which has not yet been manifested is manifest to Him; and God hears the prayers and knows the faith of those whom He has not yet called out of non-existence into existence. Indeed the Church, the Body of Christ, is manifesting forth and fulfilling herself in time, without changing her essential unity or inward life of grace. And therefore, when we speak of "the Church visible and invisible," we so speak only in relation to man. THE CHURCH VISIBLE, or upon earth, lives in complete communion and unity with the whole body of the Church, of which Christ is the Head. She has abiding within her Christ and the grace of the Holy Spirit in all their living fullness, but not in the fullness of their manifestation, for she acts and knows not fully, but only so far as it pleases God. 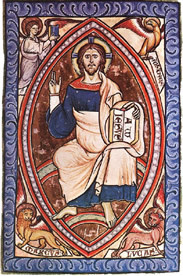 Inasmuch as the earthly and visible Church is not the fullness and completeness of the whole Church which the Lord has appointed to appear at the final judgment of all creation, she acts and knows only within her own limits; and (according to the words of Paul the Apostle, to the Corinthians, 1 Cor. 5. 12) does not judge the rest of mankind, and only looks upon those as excluded, that is to say, not belonging to her, who exclude themselves. The rest of mankind, whether alien from the Church, or united to her by ties which God has not willed to reveal to her, she leaves to the judgment of the great day. The Church on earth judges for herself only, according to the grace of the Spirit, and the freedom granted her through Christ, inviting also the rest of mankind to the unity and adoption of God in Christ; but upon those who do not hear her appeal she pronounces no sentence, knowing the command of her Saviour and Head, "not to judge another man's servant" (Rom. 14. 4). THESE LINKS were selected on the basis of their potential interest to those who visit the Ascension and Saint Agnes Web site. Comments and suggestions will receive careful attention. When using this and any other portal, however, be sure to read with critical attention and careful judgment. ANGLICAN RESOURCES. Explore the diversity offered by the worldwide Anglican Communion by way of such websites as those of the Archbishop of Canterbury, the Diocese of Washington, Project Canterbury, and Anglicans Online. ANGLO-CATHOLIC PARISHES. Visit a sample of websites of Anglo-Catholic parishes in North America, Australia, New Zealand, the United Kingdom, and Europe. Recommendations for additional links are always welcome. ARCHITECTURE. We believe that when God made us in his own image, He endowed us with a fragment of His creativity. What we build is both a manifestation of that divine gift and an expression of what we believe. BIBLICAL TEXTS & STUDY RESOURCES. The Web offers a vast collection of biblical translations and resources to help us understand the range and diversity of biblical studies and scolarship. DOCUMENTS OF THE CHURCH. Expand your appreciation of Church history by visiting scholarly centers that mainain collections of documents from the fathers of the Church through the many years of the Church and its disputes. ENCYCLOPEDIAS & GLOSSARIES. Check important facts, test your own knowledge, refresh your understanding, and expand you appreciation of the Church in the world by visiting these useful reference documents. LITERARY RESOURCES. Western literature has been shaped by the Church and by the language of its sacred and liturgical texts. These links provide access to a selection of literary works that reflect or react to Christian influences. MONASTERIES & CONVENTS. Explore the range of cenobitic communities of the Eastern and Western Churches to appreciate the dedications and dangers of monastic life in many parts of the world..
MUSIC RESOURCES. Duis aute irure dolor in reprehenderit in voluptate velit esse cillum dolore eu fugiat nulla pariatur. Excepteur sint occaecat cupidatat non proident, sunt in culpa qui officia deserunt mollit laborum. SACRED TEXTS OF OTHER RELIGIONS. Duis aute irure dolor in reprehenderit in voluptate velit esse cillum dolore eu fugiat nulla pariatur. Excepteur sint occaecat cupidatat non proident, sunt in culpa mollit laborum. VISUAL ARTS. Duis aute irure dolor in reprehenderit in voluptate velit esse cillum dolore eu fugiat nulla pariatur. Excepteur sint occaecat cupidatat non proident, sunt in culpa qui officia deserunt mollit laborum.